The InSight lander, NASA’s latest foray to the red planet, has landed. Cheers erupted on Monday at the Jet Propulsion Laboratory in Pasadena, Calif., which operates the spacecraft, when InSight sent back acknowledgment of its safe arrival on Mars. That was the end of a journey of more than six months and 300 million miles. In the months ahead, InSight will begin its study of the Martian underworld, listening for tremors — marsquakes — and collect data that will be pieced together in a map of the interior of the red planet and help would help scientists understand how Mars and other rocky planets formed. “We can basically use Mars as a time machine to go back and look at what the Earth must have looked like a few tens of millions of years after it formed,” said Bruce Banerdt, the principal investigator of the mission. InSight set down at Elysium Planitia, near the Equator in the northern hemisphere. Mission scientists have described the region as resembling a parking lot or “Kansas without the corn.” Within minutes, the first photograph from InSight appeared on the screen, eliciting another round of cheers. The image was partially obscured by dirt kicked up onto a protective but clear lens cover, but it was evident that the landscape was indeed flat. One rock could be seen in the foreground. “I’m very very happy that it looks like we have an incredibly safe and boring-looking landing location,” Mr. Hoffman said. Because the mission is not interested in rocky terrain or pretty sunsets, planners wanted a flat place with sandy soil. “There’s one rock, so I’m going to have to talk to them a little bit,” Mr. Hoffman joked. The main scientific part of the mission will not begin for a few months. Once the mission’s managers have confirmed the health of the spacecraft, including its robotic arm, the arm will lift the spacecraft’s primary instruments off the main deck of the lander and place them on the Martian ground. That requires some additional care. “You need to make sure you actually have the grapple on the payload before you lift it up and it’s actually on the ground before you let it go,” Dr. Barrett said. One simple thing Dr. Banerdt hopes to learn: how thick is the crust of Mars? He recalled a project he worked on as an intern in the 1970s where the thickness of Mars’s crust needed to be known. “We just had to fake it, because we had no idea,” he said. InSight should finally provide the answer. “That’s one measurement I would like to go back to the old paper, plug it in to see how close I was,” Dr. Banerdt said. Other questions the mission aims to answer: How often does the ground shake with marsquakes? How big is Mars’s molten core? How much heat is flowing up from the decay of radioactive elements at the core? InSight’s landing on Monday was live-streamed to viewing parties across the country, including in Times Square in New York.Credit Jeenah Moon for The New York Times. To study these questions, InSight will use two main instruments: a dome-shape package containing seismometers and a heat probe that is to burrow about 16 feet down. NASA has spent $814 million on InSight. In addition, France and Germany invested $180 million to build these main instruments. The seismometers, which are designed to measure surface movements less than the width of a hydrogen atom, will produce what are essentially sonograms of the planet’s insides. In particular, scientists are looking to record at least 10 to 12 marsquakes over two years. Temblors on Mars are not caused by plate tectonics, like on Earth. Instead they are generated when the planet’s crust cracks because of its interior’s cooling and shrinking. The seismometers could also detect other seismic vibrations from meteors hitting Mars. InSight’s landing wasn’t NASA’s only success on Monday. The agency used the mission to test new technology. Two identical spacecraft known as Mars Cube One, or MarCO for short, launched with InSight in May. MarCO A and B then separated from InSight’s cruise stage and have since been trailing behind it. Hundreds of miniature satellites known as CubeSats have launched into orbit around Earth in recent years, but this is the first time that CubeSats have been sent on an interplanetary voyage. 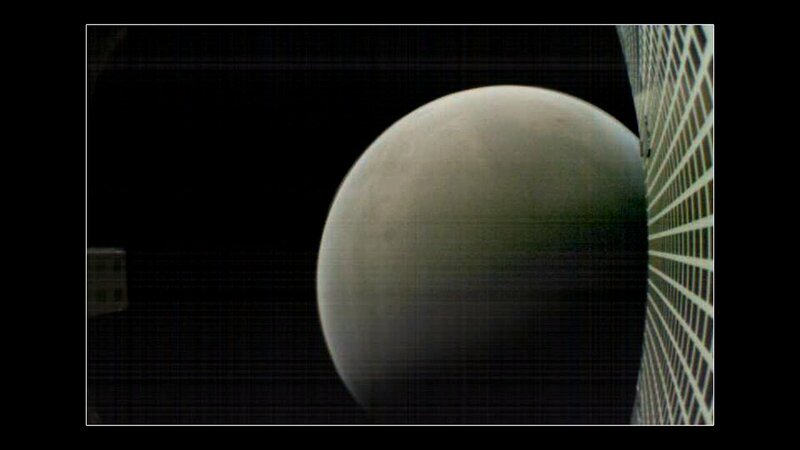 The MarCO spacecraft relayed InSight’s telemetry to Earth flawlessly, enabling the immediate celebration. “This has been a fantastic day for spacecraft great and small,” said Andrew Klesh, the chief engineer for the CubeSats. He showed a picture of Mars taken by one of the MarCO satellites shortly after the InSight landing as it sped away from Mars. “This image is really our farewell to InSight, our wish for good luck and a farewell for Mars itself as we continue on,” he said. InSight joins a busy cast of Martian robotic explorers. In orbit, NASA also has the Mars Reconnaissance Orbiter, Mars Odyssey and Maven. The European Space Agency has Mars Express and the ExoMars Trace Gas Orbiter. The Indian Space Research Organization has the Mars Orbiter Mission, also known as Mangalyaan. On the surface, NASA currently has the Curiosity and Opportunity rovers, although solar-powered Opportunity has been quiet since the summer when a global dust storm prevented it from generating enough power to operate. And the year 2020 could get busier, when NASA is planning to launch another rover that will search for the building blocks of life. China, India, Japan, the United Arab Emirates and a European-Russian collaboration are also all intending to launch missions to Mars then.